Private Use - Easily stored under the seat or in the boot for breakdown situations. Police - PortaCones can be used for traffic control, emergency use on the road and to cordon off crime scenes and other incidents. Fire Service - PortaCones used in a wide variety of emergency situations from hazard marking to scene control. City Councils - PortaCones provided to outdoor staff who occasionally need cones but don't have room to store non-collapsible types. Utility Companies - PortaCones used on utility trucks for emergency work and general maintenance. Bus Companies - Carry 700mm PortaCones in vehicles for emergency or breakdown use. 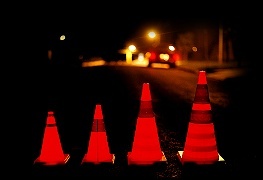 Surveying Firms - Use 900mm cones instead of traditional road cones in surveying activities. 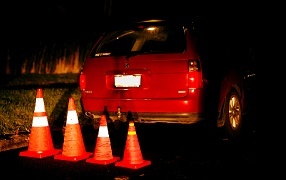 Tow Truck Operators - Carry 900mm cones to use as traffic hazard indicator, particularly at night-time. Fleet Operators - 450mm, 500mm or 700mm cones are ideal to ensure staff safety in breakdown or emergency situations. Event Managers - PortaCones ideal for cordonning off vehicle drop-off points, VIP entry areas and temporary parking or marshalling areas. Roadside workers protect themselves and their vehicles with several safety cones, but even a single safety cone is better than none at all. For general breakdown use, 3 safety cones would be optimum with them laid out in a diagonal line as shown in the diagram, and facing the approaching traffic. The furthest safety cone should be stepped back from the vehicle as far is practicable (10 metres or more) and the nearest one as close to the edge of the approaching traffic lane as possible and within a metre of the rear of the vehicle. If using a single cone, the position used should be that of the one closest to the vehicle in the diagram.